Rising Nashville songwriter Sophie Sanders has unveiled the first single from her forthcoming record "Steep and Shining Spaces." “Still Waters” featuring Amy Grant premiered July 25 on Billboard. 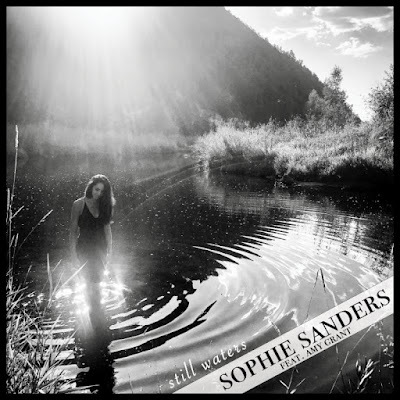 Last fall, Sanders traveled to Amy Grant and husband Vince Gill’s home studio to record the track with the help of Grammy-nominated producer Felix McTeigue. Born and raised in Nashville’s music community, Sanders grew up with a deeply ingrained love for writing, but never took interest in songwriting until after college; she wrote some of her first songs while in the Peace Corps and has been writing ever since. Steep and Shining Spaces is a collection of those songs and an intimate look at her life over the past half decade. “Still Waters” is available now via Spotify and iTunes. If you had told the young Sophie Sanders and her parents that she would one day be making a record, they wouldn’t have believed it. Sanders was born in Nashville, Tennessee, as the youngest child of a teacher and then struggling songwriter. Quiet from the start, she watched and listened as her father’s career took off like a rocket in the early 90’s and kept soaring through the early 2000’s. Sanders was always around music, but expressed no interest in making it.She never tried picking up one of the guitars around the house. The self-admittedly shy child certainly had no plans to sing. Sanders did, however, love writing. She wrote poems, prose, and even a book one summer. In 2011, she graduated from the University of North Carolina at Chapel Hill with a B.A. in Psychology and Anthropology, and a pending Peace Corps assignment. The next week, on a fateful mid-May day, she had her wisdom teeth removed. It was then, in a restless, swollen, life feels so strange right after college state, that she picked up one of her father’s guitars. The songs came soon after. Sanders served as an English Education volunteer in the Peace Corps in Indonesia from 2012-2013. She practiced guitar on long, hot afternoons after teaching at the local high school. Soon, Sanders was putting words to music, laughing that 10,000 miles of distance had convinced her that she really belonged back home, in Music City, U.S.A. Once she came home, she was home to stay. Sanders began recording her first record "Steep and Shining Spaces" in late 2017. The project is a personal one, featuring seven songs she wrote solo and four co-writes. The record was produced by Felix McTeigue and predominantly recorded at Trace Horse studios. As a family friend and fellow part of Nashville’s tight-knit music community, Sanders and her dad asked Grant, and much to both of their surprise, she agreed without hesitation. Sanders hopes her record will give her a name as a writer. Whether it leads to more records or not, she isn’t sure. For more information, visit sophiesanderssongs.com/.